When you think of Burger King, what is the first thing that comes to mind? Whopper, right? How about McDonalds, Nashville, TN or Hollywood? If you answered Big Mac, Country Music and Movie Stars, the same things came to my mind. Why do you suppose we automatically think of these items or industries whenever the company name or location is mentioned? Branding!!!! Burger King and McDonalds offers a wider menu than just the Whopper or Big Mac. Hollywood is much more than the Movie industry and Nashville is more than just having Country Music, but they developed a niche through branding so whenever you hear their name or see their advertising you know who they are and what they do. Can you or your community say that about your Grange? Many Grangers cannot, in fact many members really do not know what their Granges purpose is. I have had some calls recently raising concern of Granges “putting all of their eggs in one basket” regarding their community service and public image. I am not concerned at all; actually I applauded those Granges that have a main focus for their community service efforts, as long as they balance their community service program with a diverse outreach of support. I am fortunate to belong to a Community Grange that has focused its effort on the children in our community through our support of the local school. Ekonk Community Grange is a household name in most of our community. 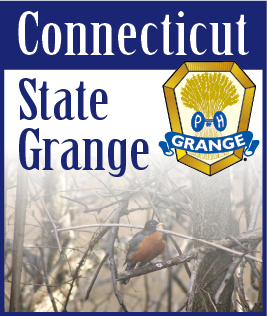 The key is we do not stop there, our members participate in many other activities and our Grange picks a new major project annually. The hard work of Ekonk Community Grange # 89 was acknowledged by the National Grange this past November when they award Ekonk Community Grange with first place in the National Grange Community Service Program. Congratulations to all of the Members and to the community. Ekonk’s niche is the community school, I would say that Lyme Granges niche is their Nationally recognized Agricultural Fair, the same with North Stonington Grange, Wolcott Granges is their work with the animal shelters, Winchester Grange is their annual Strawberry Festival, Cheshire Grange is their work with and for veterans, and Norfield Grange is their Winters Farmers Markets, just to name a few. Just like Burger King and McDonalds, when anyone says North Stonington Grange people will usually say, “That is where they hold the Fair in July,” like it or not, that is a niche. Where we need to be is when someone talks about the town of Winchester, the response is “you know, the town with the incredible Strawberry Festival at the Grange.” Then we are a house hold name. Your niche is your identifier. Your niche needs to make an impact/impression on and for many. For a Grange, your niche is not entirely who you are, it is part of how you are. It is part of your story, if you recall last month’s article. Your niche enables your Grange to develop your story and leads to intrigue, excitement and discussions with the person you are telling your story too. After all, who doesn’t like a good story?